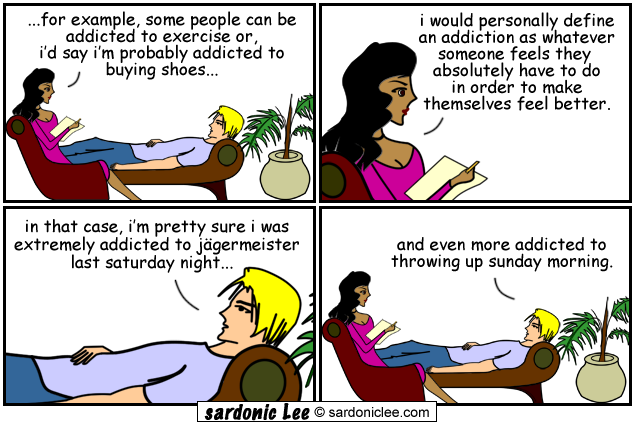 I think I am becoming addicted to these comic strips. What a feel good moment, as usual. Hit me again Jack. Vitamin D straight out of the sky! Hope the toilet didn’t get too drunk. was so addicted to weekends, had to make every day the weekend! As one friend astutely told me, I’m an addict magnet. If anyone needs to borrow the addictionary please let me know, happy to share, but will need it back ASAP. two pairs of shoes and 2 bottles of wine! my perfect weekend!! Story of my life last week!